A while back one of my relatives purchased an Apple laptop. I asked her why she had bought the Apple and her answer was that "everyone says they're good" (or words to that effect). She didn't have any experience with Apple laptops or any particular knowledge or specific reason to get an Apple laptop. She had simply heard they are good and given the good reputation and good experiences she'd had with other Apple products like the ipod she decided to buy Apple instead of PC. All the other computers in my relatives home are PCs. I doubt she could tell me any specifics about the hardware in the Mac versus any other computer. She had no specific requirement to use a Mac for school or work. In fact I doubt they use the Mac for much more than light web surfing and her kids playing around with the built in webcam and other applications. From what I know I would think if she'd bought a cheap $500-600 PC laptop such as a ASUS K53E-A1 then it would have served their needs just fine. Apple makes some very good products and has significant success in recent years. They were recently ranked the #8 brand name in the world. There are a lot of good reasons to buy an Apple Mac laptop. However these great Apple products don't come cheap. The least expensive Macbook is $999. You can get a PC laptop of similar hardware specs for $600 to $800 range. However its hard to do a true apples to apples comparison between the Mac and PC since the Macs have solid state drives and PC laptops generally seem to only offer those on high end models. The SSD would add about $50 to the actual costs so you are getting the benefit of a +$50 more expensive drive with the Apples that you dodn't see on PC laptops in similar price range. Apple has some very enthusiastic fans. I'm not about to try and convince an Apple fan that they should not buy an Apple. If you already have a long list of reasons of why you want to buy an Apple or if you attend Apple conventions then this article is not targeted at you. I'm trying to address the general consumer out there who doesn't really know too much about the differences between the PC and Mac platforms other than what they see in clever Apple commercials. I'm talking about the people like my relative who bought an Apple on little more than general perception of the brands reputation. Do you have a particular NEED for an Apple system? When I say 'need' I mean a real specific, justifiable reason to buy an Apple rather than a PC. This would be something along the lines of requiring specialized software for work or school that only runs on Apple. If you're a graphics design artist then its quite common for people to use the Mac platform. Or if you're already an Apple user and have been for some time then you may have a lot of files that are in Mac native formats and difficult and/or time consuming to transfer to PC. If you're barely getting by or you have consumer debts that are unpaid then you really should not be paying extra for a more expensive brand name. Apple laptops are significantly more expensive. If you can not absolutely afford that extra cost then it should not be something you spend the money on. Generally unless you have a 'need' as discussed above then paying extra to buy an Apple is really a splurge or a luxury. You should not rationalize it as a 'need' just because you 'need' a computer. You may 'need' at minimum a $400 simple laptop but you 'want' to spend an extra $600 to get a $1000 Apple. What will buying an Apple get you? You should be able to list the benefits of buying an Apple or buying a PC. You may be buying an Apple because you like the ease of use or because you appreciate the styling or due to the higher reliability. On the other hand buying an Apple may have some drawbacks such as poorer compatibility with the computers at your work or unfamiliarity with the Mac OS. So what are your answers to these questions? 1. Do you NEED an Apple for a specific purpose? 2. Can you easily afford the extra cost for an Apple? 3. Can you say specifically what the extra benefits of the Apple are? If you didn't answer yes to any of those questions then you should not buy an Apple. If you can afford to spend the extra money and you have a legitimate need or at least know the specific reasons you're spending more money then it may be worth it to you to spend the extra money. 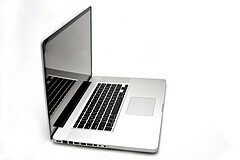 Generally I would argue that most people should not spend the extra money for an Apple laptop. Most people can get all they need out of a more affordable PC laptop. But if you really like apples or really know what you're paying extra for and you can afford it then that is OK too. The bottom line here is that you need to know why you're paying more and make an informed decision and of course nobody should spend extra on a product when they can't really afford it.